Aluminum Splints - lightweight, rigid aluminum splints provide the support necessary to protect from further injury during the healing period. Padded styles consist of 1/4” polyester foam bonded to the rigid aluminum. Please order by stock number and description listed below. If available in both styles, please specify padded (P) or Unpadded (0). 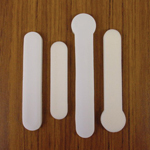 Plastic Splints - lightweight, neutral-colored, usually used without padding. Provides protection for the top as well as the back of the finger and thumb. Both styles are available in kits or individually. Includes 3 each of the following padded splints: 4010-P1, P2 and P3, 4011-P2, P3 and P4, 4012-P1, P2, P3 and P4, 4013-P1, P2 and P3, 4015-P1, P2 and P3. Toad Splint 4010-P Available padded only. 4014-P0 One size Available padded only. 4015-P2 Medium Available padded only. 6 each of 8 sizes in a divided plastic case. Also available in packages of 6 each. Aluminum stay laminated with closed cell foam then vinyl.